1 = Name. This includes the common and latin plant name or chemical name and IUPAC name. 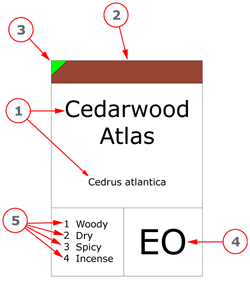 2 = Key odour classification (colour coded). This refers to the most prominent odour description. 3 = Type of note (colour coded). Within a fragrance a wearer will smell the top notes first, heart notes next, and base notes last. Fragrant materials differ in the rate in which they evaporate, in part due to the size of the aroma molecule. This makes some materials able to pass from regions of high concentration to regions of low concentration relatively quickly. Such materials are said to be diffusive. The more diffusive a molecule, the more likely it is appear as a top note in a composition. Less diffusive materials, which become evident after two minutes on a smelling strip are generally regarded as Heart notes and it is these, along with the heavier base notes that provide a theme to compositions. Grading of raw materials in this way is extremely difficult and not an exact science, especially with essential oils and mixtures of aromatics. We have nevertheless, where possible, categorized the materials according to the views of Perfumers and connoisseurs from within the industry because it is useful as an aid creativity. EO = Essential Oil, usually extracted by steam distillation or cold pressing. ABS = Absolute, extraction using a solvent, usually hexane. This is reserved for odor compounds that are harder to extract such as florals and retains a more natural odor profile. CON = Concrete. This is also a solvent extraction, but the end product is a semi-solid waxy substance. SYN = Synthetic. This is an aroma chemical usually synthesised from wood (pine) or petroleum by products.RES = Resins (or oleoresin). These are generally compounds naturally secreted a plant. This also includes balsams which are naturally aromatic or scented oleoresins. RAW = raw materials such as plant materials and herbs.5 = The four key odour descriptions. These odour descriptions typify the product and are are ordered from the most to least prominent. 5 = Key odour notes. These are the 4 key odour notes generally in ranked order of promenance.